Toni Yates has the details from Irvington. 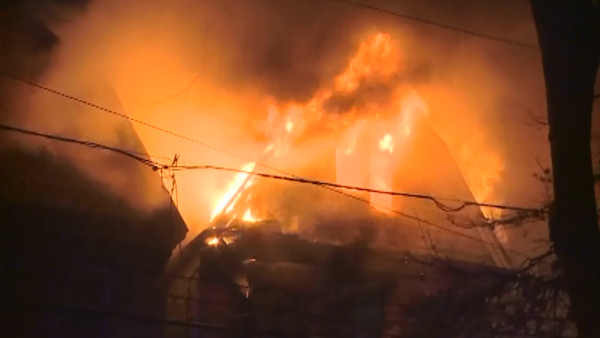 IRVINGTON, New Jersey (WABC) -- Authorities are investigating a house fire in New Jersey Monday night that left a man dead. The fire broke out shortly before 11 p.m. at the two and a half story home at 21 40th Street in Irvington and went to two alarms. The body of a man, believed to be in his 60s, was discovered on the third floor and removed from the home, according to Acting Essex County Prosecutor Carolyn Murray. Because the victim was badly burned, formal identification and the cause of death are pending. Two people who knew the victim said he was a friend. "When I was homeless he took me in, he'd give me the shirt off his back," one woman said. Four other adult residents escaped from the home without injury. The flames reached from the first floor to the roof. The house contained three apartments, one on each floor. The fire was so intense firefighters couldn't get in through the home's front door and had to go in from a third-floor window. The blaze was placed under control two hours after it began. A man who lives next door said someone woke him up telling him his home was in flames, but firefighters were able to keep the fire from jumping over and engulfing that home. The man said there is smoke and water damage in his apartment, and he plans to move. The Red Cross is helping two families find shelter.